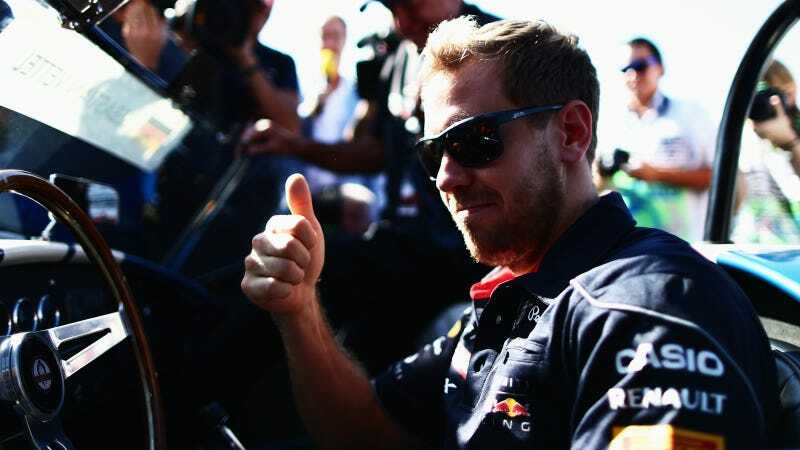 In a development that should surprise exactly no one, now four-time world champion Sebastian Vettel of Red Bull took home the win today in the second-ever United States Grand Prix in Austin, Texas. And yes, donuts were done, in what was perhaps Vettel's way of showing he's even more like Ricky Bobby than we think. Last year it was Lewis Hamilton who emerged victorious at Austin's still-new Circuit of the Americas, but Vettel continued the dominant driving we've seen from him all season with a lengthy and substantial lead over everyone else throughout the race. The man's good at what he does. Good for him. Even though Vettel has already locked down the 2013 championship, his victory at Austin was a big deal. Today marks his eighth win in a row, breaking a record established by Michael Schumacher in 2004. But while Vettel's victory up front is no shocker, the race in Texas as replete with excitement behind him. If this race — donuts and all — doesn't prove to Americans that Formula One is thrilling to watch, I don't know what will. You had Adrian Sutil of Force India knocked out of the race in the very first lap following a collision with Williams' Pastor Maldonado. You had Romain Grosjean, once regarded as "a sketchy character in the paddock," to quote one announcer here at Austin, proving he has what it takes to be a top-tier driver today. And you had a dramatic dogfight between Grosjean and Red Bull's Mark Webber for second place towards the end that for me was the one of the biggest highlights of the race. Webber had to settle for third, but he still had an awesome showing. Texas hasn't seen the last of Webber, either — "I'll see you next year in the Porsche," he said at the podium. All in all, it was a great day of racing, even if the end didn't have a huge upset some were probably hoping for. Between this race and 2012's, I'd say F1 is off to a great restart in America. And that's good news.